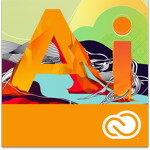 Meet the most powerful and connected Illustrator® ever. The new Touch Type tool gives you even more control over type: Move, scale, and rotate individual characters knowing you can change the font or copy at any time. And with Illustrator CC, you can share work directly from within the application, sync colors from Adobe® Kuler®, and sync fonts from Adobe Typekit® desktop. Your entire creative world, together in one place. Only in Creative Cloud. Notes (Price and availability subject to change without notice).